Months ago I was asked by a lady called Ali Meehan if I would be willing to make some artwork for the 2019 planner she was planning. Ali is the founder of a community called ‘Costa Women’, for women living in Spain (or dreaming of/hoping for a life in Spain). There are women from 64 different countries connected with each other through this community, and I’m one of them. And so there was this idea of Ali’s to make her own planner, since she couldn’t find one to suit her specific needs. 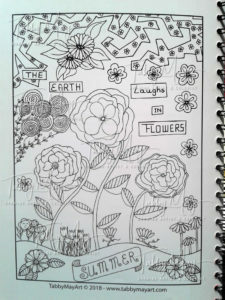 When she saw bits and pieces of my artwork she figured it might be interesting to add some of it in her planner. At first I thought she meant artwork like the things I do in my art journals, but pretty soon I realized she wanted me to draw coloring sheets. Hm… okay… I accepted, although my drawing skills are improving but yet far from perfect (imho). It took me quite some time to come up with inspiration and to be able to actually draw something that would satisfy Ali’s need for artistic work and my own perfectionistic expectations. Why do I make it so hard on myself sometimes? 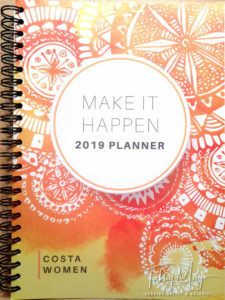 Anyway, it all worked out and November 9th 2018 I finally got to see the end result: the Costa Women ‘Make It Happen Planner 2019’. And it’s a lovely planner to see. It can be used like a bullet journal, because it contains a key (icon legend) in the front. It has room to write down all the things you’re grateful for, your goals, things you want to learn, a balance wheel, there are social media exercises and ideas, quotes, end of month evaluations to fill in, and obviously there are weekly calendars, monthly calendars and a yearly calendar for 2019 as well as 2020. 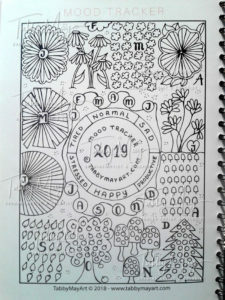 Wanna have this planner, for free? And there is my share in the making of this planner: four coloring pages and a mood tracker, which is also a coloring page. I will start telling you about my contribution to the planner, since I’ve got several things to say about it. But before you think ‘neh, I’m not going to read any further’… think again, because I’ve received one copy extra from Ali. To give away. 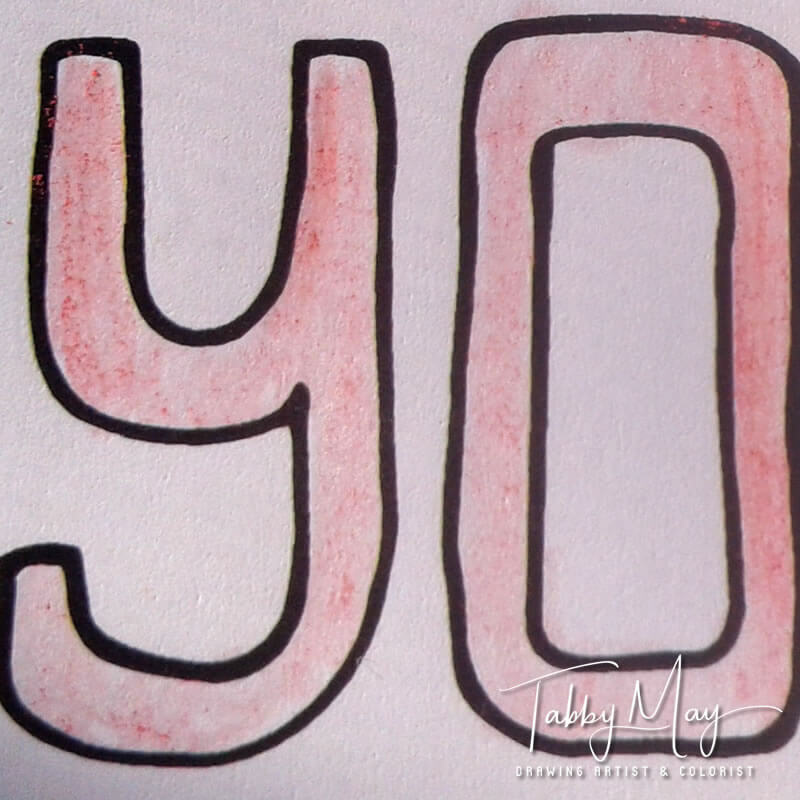 Maybe even to you! More about that later on, first a little more about my drawings. 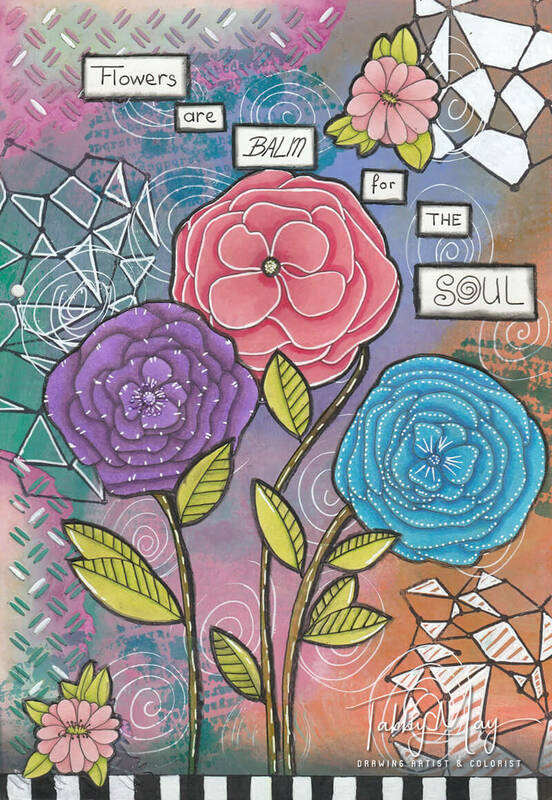 The first design that I drew was inspired by a page I made in one of my art journals. 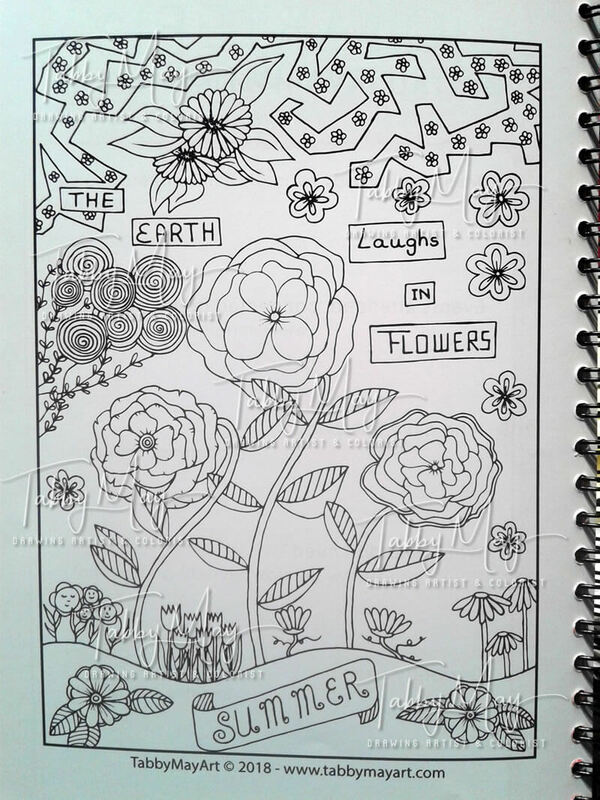 It was a summerly page with flowers, more flowers and then some more flowers 🙂 . 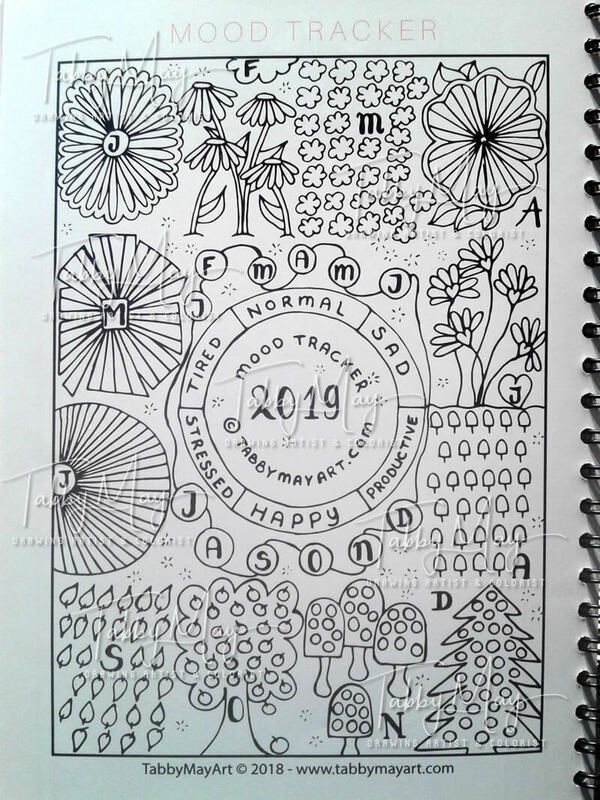 Because it was based on an existing page, with drawings that I had done myself, it wasn’t too hard for me to draw something similar for the planner. But then the challenge began: what next? Then I remembered a piece of art that I made for our home office. I only had to look to the wall on the right side of my desk where it’s hanging. So drawing number two wasn’t that hard to make up of either. The end result however wasn’t exactly living up to my perfectionism, but my husband as well as Ali said it was ‘great’. Okay then, I gave in and accepted that maybe I was being too hard on myself (although I still think it’s not my best drawing. Me stubborn? Neh… hahaha). 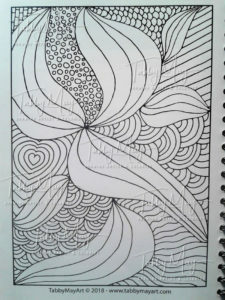 For the next one I was thinking of drawing a kind of mandala. Problem was that I’m not very experienced in drawing mandala’s… So I drew a circle in the center of a blank page. At least I had a starting point there. Then I drew some curved lines from the center to the edges of the circle, to divide it in different parts. 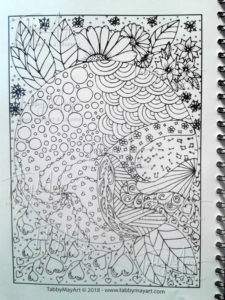 After that I started to draw patterns, in each part a different pattern. And before I knew it the circle was filled. I erased a couple of lines, and others were left intact. Next Ali came with another request: could I draw a mood tracker? I’d never tried, but hey, I said ‘yes’ the first time, so what the heck… sure, I can! (While I agreed to Ali, my inner self started talking, or it was more like yelling: “NOOOOOOO… what are you doing????!! You’ve never done that! What if it doesn’t work out?! You could easily fail!!! And what will you draw??? ?” Oh yeah, I’m so supportive to me sometimes 😛). My husband encouraged me, telling me how confident he was that I could do this. And he was right. I started measuring equal rectangles, drawing dividing lines and then filling the spaces with whatever came to my mind. For January I made flower with 31 petals, February four flowers with 28 petals, March 31 tiny clouds, and April another flower. For every month I thought of something to match the season. Although I’m not sure what May stands for… Wood possibly, to build a new fence in the garden. Or just a strange angular flower 😛 . June heart shaped flowers, July a Spanish fan with 31 segments, August ice creams, September leaves, October apples on an apple tree, November mushrooms and a Christmas tree for December. How does the mood tracker work? In the middle are the six moods to choose from. The idea is to give all six a different color. 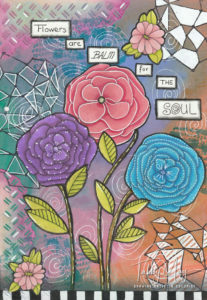 And then for each day of each month you color a segment/petal/ice cream etc. with the color of the mood you’re in that day. Surrounding the circle in the center are the first letters of each month. These can be colored when the month is over. Then you give it the color of your overall mood for that month. Well, having come this far I will show you a video that I’ve made of the planner. It’s a flip through video, combined with photographs of specific pages that I wanted to highlight for you. Being a colorist for several years now, I obviously had to try the paper. How well is this very (VERY) smooth paper suited for coloring materials? Well, I have to be honest. I’ve tried brush pens (Zig Clean Color) and pencils (Staedtler Ergosoft), and both are horrible on this paper. With colored pencil I’m used to work in layers. To build up the color and add shadows in several layers. But that’s impossible on this paper, because it’s got no texture for pencil to adhere to. Similar problems with the brush pens. With good quality paper and pens (whether brush pens or markers, or even quality felt tip pens) it’s easy to blend colors or make gradients. I’ve tried, but the paper doesn’t allow any blending. Not with the pens themselves, nor with a water brush. And that’s a real disappointment, since this means that people who normally don’t color, will now get frustrated that their coloring doesn’t look very good. And that has nothing to do with their coloring skills, but it’s due to the unfit paper! This could mean that my drawings might contribute to people not liking coloring, instead of encouraging them to color. Because the drawings are printed on the wrong paper for coloring. And that really saddens my heart! Another thing is that the coloring pages are all placed on the left of the binder. For right handed colorists (which the majority are) that is very unhandy! 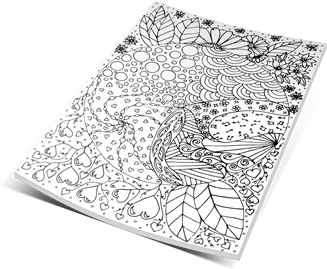 Click HERE and print the coloring sheet on paper of your choice. Color it in the way you like. You may use any material you want. 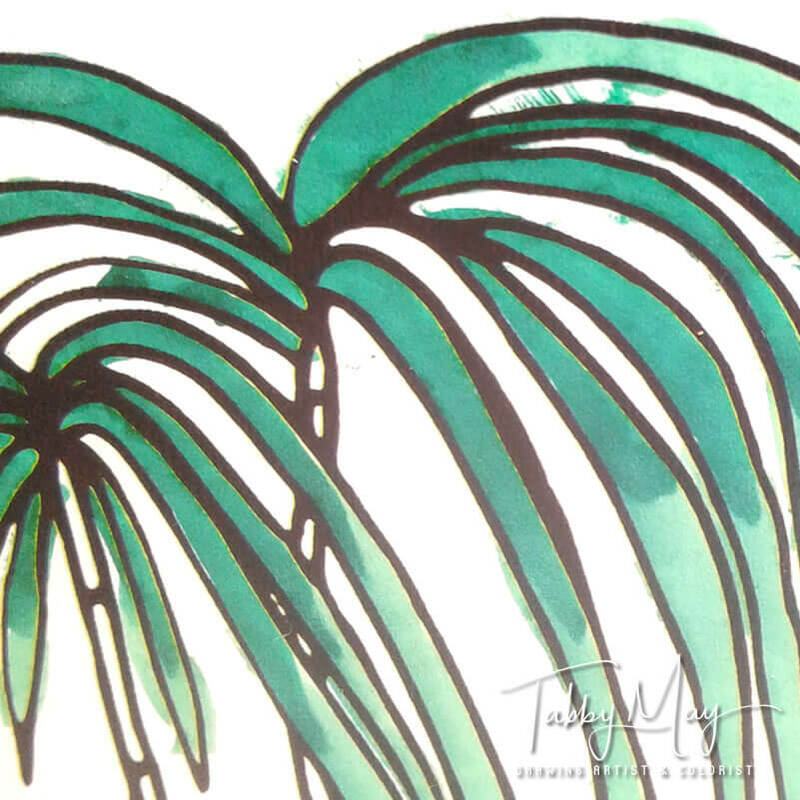 Colored pencils, pens, paint, markers… whatever you like. Add a photo of your colored sheet. !! Remember that my copyrights line below the drawing needs to be visible (that goes also for when you want to upload your work to other Facebook Groups, Instagram or wherever you want to put it. The copyright line has to be visible) !! 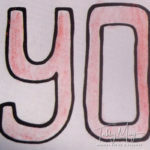 You’ve got until Januari 28th 13:00 to finish and upload your work. 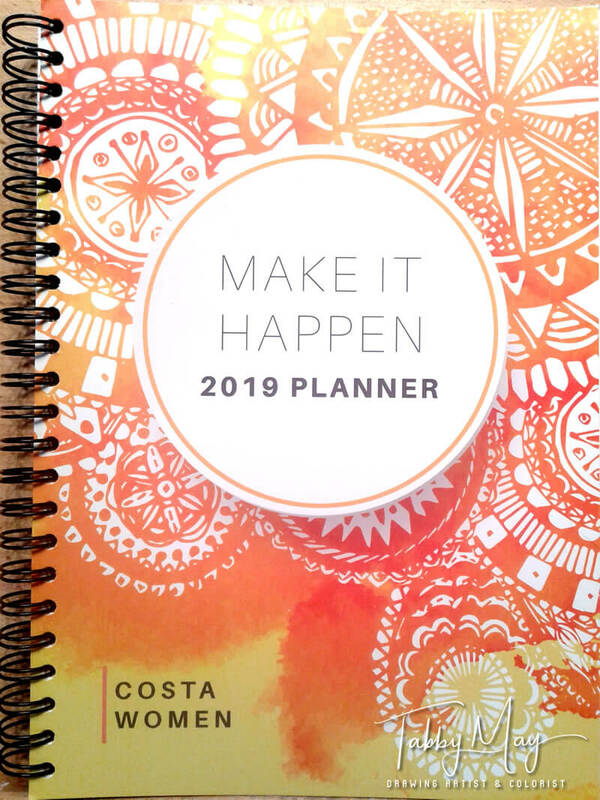 That evening at 20:00 I will announce the winner of the Costa Women 2019 Planner! 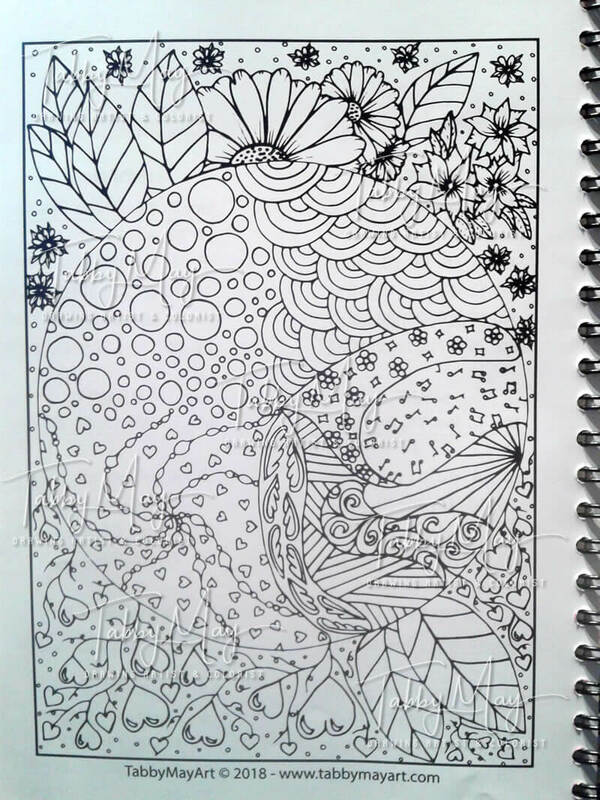 Well, I wish you good luck, and happy coloring! I’m really looking forward to what you’re going to make of it! Next: Go with life’s flow… and then what?